Wayne HS Cross Country State Meet Course Walkthrough: Get Ready For A Fast Finish! Wayne, NY - The Cross Country State Meet returns to Section 5 for the first time since Marcus Whitman held the event back in 2003. This marks the second to last year that the State Meet will be passed around in a Sectional Rotation, and the first time ever on the Wayne HS Course. 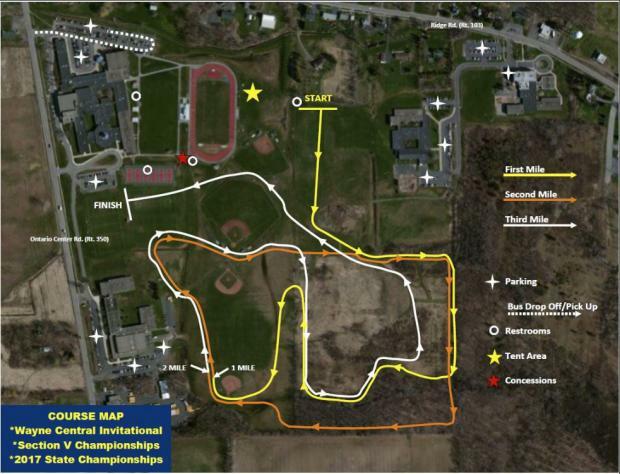 To get you familiar with the terrain that will host the most important meet of the year, a course video has been provided courtesy of Wayne XC program and Mr. Strauss, as well as a written description, and a colorized course map to give you all the ins-and-outs of the flat, fast course. Study up HS Harriers, as course knowledge could make all the difference. Note: The only early-access to the course will be at the Wayne Eagles HS Invitational, held on Sept. 16th, also known as Pre-States. The course starts with an open 200 meter run, and then a bank left into wooded paths. This is a slight up and down hill at roughly 400 meters. At the bottom of the hill, you turn right into an opening that leads to another wooded path and the 800 meter mark. Following the path around for about 300 meters, there is a left turn into an open field along a hedge row. This takes you to a right hand turn to the 1st mile marker, just before the baseball backstop. Around the backstop the course remains flat with only a few rises and a right hand turn towards the baseball dugout that leads you back into the first part of the course, roughly 2400 meters. After going up and down the first hill, the runners will go up a steeper hill into the wooded trail that is roughly 400 meters. Once exiting the woods, the runners will turn right then left and follow the course, again, around the baseball backstop, roughly the 2 mile mark. After they pass the baseball backstop they will turn right, backtracking, into the wooded path, roughly 4000 meters mark. They will then follow the path to the opening, where the 800 meter mark was. The runners will then veer left into another wooded path up a hill going past the 4400 meter mark. At the top of the hill they turn left, then right, down a hill that will lead them towards the baseball field scoreboard and the 4800 meter mark. The runners finish on a flat 200 meter run to the finish chute which is set out on a practice football field.